Camogli rivals the Cinque Terre these days when it comes to desirability. The less I say about this magical seaside resort the better—the crowds are growing by the year, and the last thing any authentic town needs it to become like the Cinque Terre (gorgeous, but a theme park of tourism). 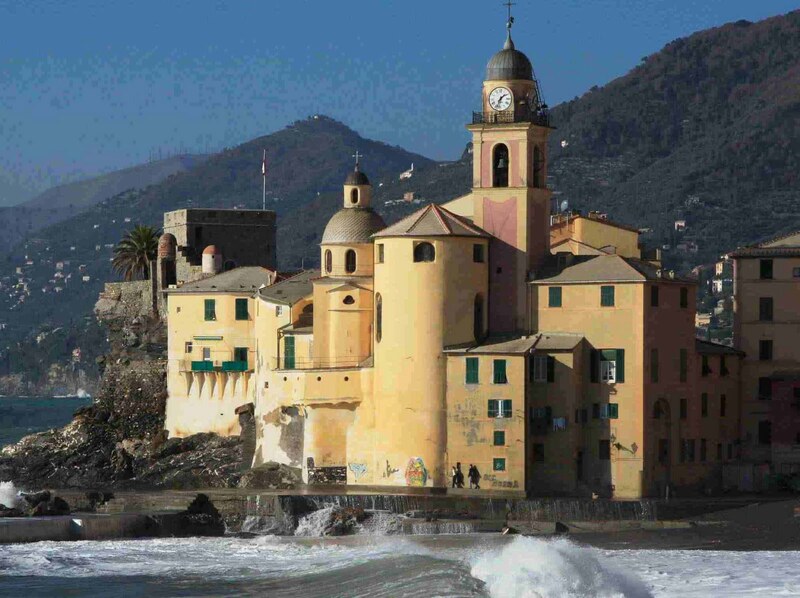 Camogli isn’t famous for its restaurants, though it does have a few good ones (I list a couple in Food Wine Italian Riviera & Genoa, but there wasn’t enough room in the book to include all of them). One of our favorite very simple eateries in Camogli is La Rotonda, on the seaside walk—below the walkway, in fact. Take the staircase down from the southern end of the promenade and you’ll find this aptly name rounded restaurant with wrap-around windows perched just above the waves. You’ll also leave La Rotonda a little rounder than when you entered, though that isn’t to suggest the food is heavy. It isn’t. Focaccia al formaggio—that cheese-filled, thin, luscious form of focaccia usually associated with Recco—is the house specialty. We always have it. La Rotonda is designated a “Focacceria” and not a restaurant, but such categories are meaningless in Italy. You can get good seafood antipasti (anchovies in lemon juice! ), classic first courses of pasta or risotto, and fresh fish. I love (and of course ordered as I always do) the small fry—fritto misto. It’s composed primarily of squid, calamari and tiny red mullet, their tiny eyes staring at you as you gobble them. What surprised me this time around were the desserts. We usually skip them. But the display case caught my eye as I went to wash my hands after the fritto misto. I asked, as I usually do, which of the cakes, pies and puddings were made in house. “All of them!” replied the cheerful waitress, who was authentically cheerful. The locals come here for the focaccia al formaggio, as noted, and despite the location there really aren’t many tourists, especially out of season. We spotted a couple of business people we know in town, plus a table with three city gardeners, and a romantic couple. Democratic or egalitarian is how I’d describe the clientele (no Berlusconis or other oligarchs were present—the tables are too small, the settings too simple). Food is the main attraction for us but the view is splendid, as long as you like crashing waves, frescoed facades, a Baroque church, and a medieval castle, not to mention cliffs and terraced hillsides, with villas wrapped by groves of olive trees. The comfort level is acceptable. This is not a posh restaurant, as noted, but the chairs don’t give you an ache in the posterior, either. Back to those incredible desserts: on offer was a perfect house-made apple pie, a lemon-and-pine nut pie, a strawberry pie, a variety of puddings and fresh fruit salads, and an impressive, gorgeous millefoglie—what the French call millefeuilles—made with goopy chocolate and heavy whipped cream and of course the finest, crispiest, translucent dough in many layers. All the desserts had been made that morning by the young chef. We succumbed. Guess which? I was sure Alison would take the apple pie. But because she saw me making saucer eyes at the millefoglie, that’s what we wound up with. To die for? Yes, though we felt invigorated instead of dead. Italians don’t feel like dying when they enjoy a meal. There’s not much sin or suffering involved. And since I’m genetically half Italian, I seem to be immune to dying over luscious food (knock on wood). The bill came to a little under 30 euros per head. We could’ve eaten less. But we’d hiked about 10 miles that morning. And what the hell, we are on vacation. If you’re looking for my Paris, Paris Tours blog, please click here!